Hello Just Us Four readers, I am so happy to be here and guest posting! My name is Ciara and I run a blog called Teaspoon of Life. I am one of 13 siblings, a mommy to a rambunctious little girl, and wife to a wonderful husband. In my spare time, besides blogging and taking care of my little princess, I love to cook/create recipes, and occasionally do some crafts. This is only my third Christmas with my husband and we don’t have many decoration yet. We agreed on our first Christmas together that we would only get a few decoration each year (so we aren’t spending all our money at once). Also even more important, so we have something special for each year. This year I am in a very creative mood and decided to make something! I had a thought in my head of a door decoration and by making it myself it makes it even more special! I decided to make a Christmas wreath because they can get so expensive at the stores sometimes! So for this project, You can find the majority of these items at the dollar store, Walmart, or local craft store(My local craft store is Micheal’s).I found beautiful, glittery pine cones there for only $1! 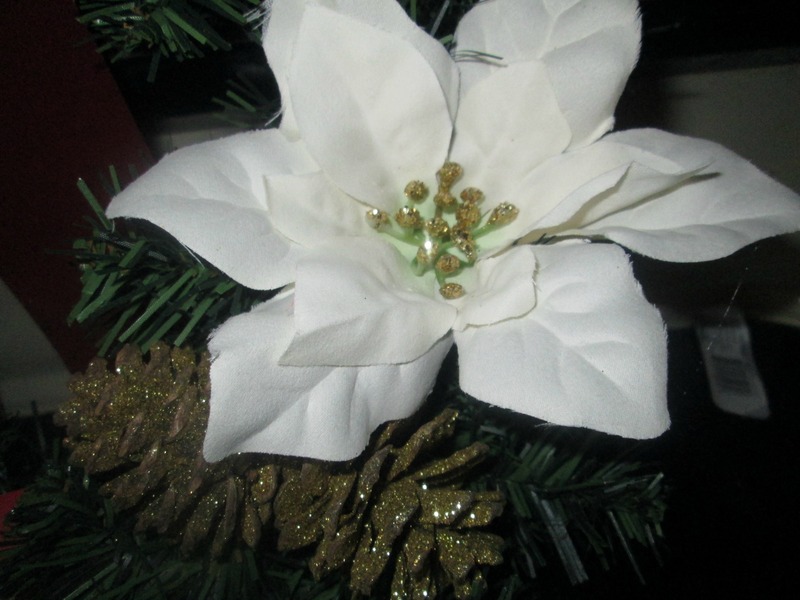 I also bought from Micheal’s a wreath ($1-2, depends on size), white flowers ($2), and the bow ($1). The wood plank I found at Walmart for $1. 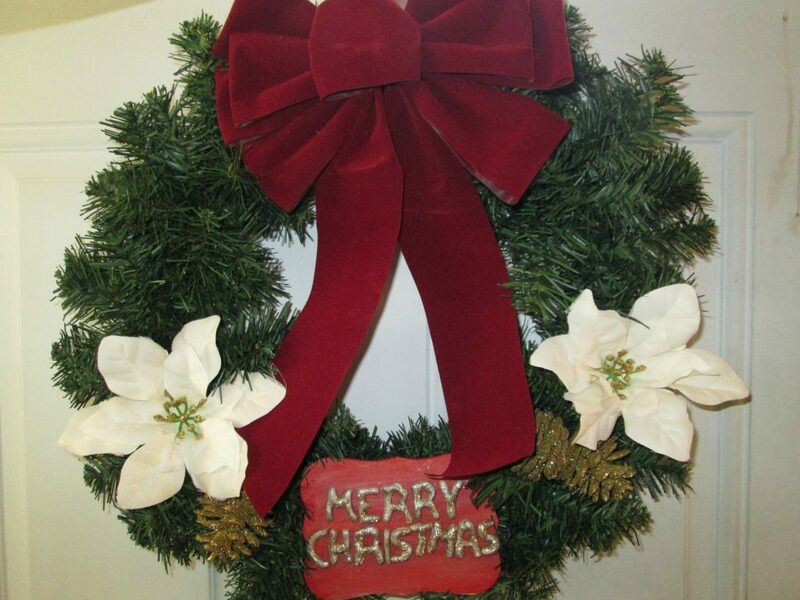 So overall you can make a wreath the way you would like for fairly cheap! 1.) Make Salt dough, roll out and cut out letters needed to spell out Merry Christmas! Cook according to instructions! When finished, paint the letters and plank. 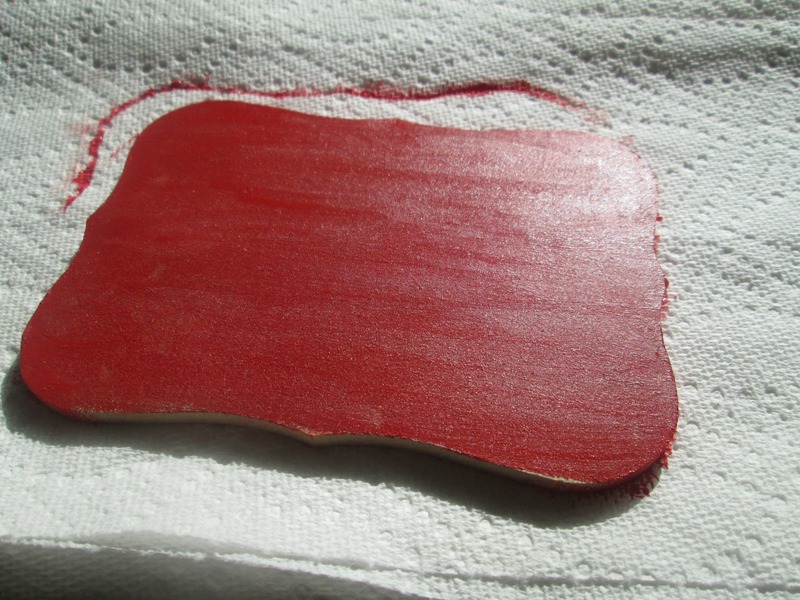 (Paint on paper towels or old towels, something you don’t mind getting messy). 2.) Most bows come with twisty ties attached. If yours has one, twist it to the top of your wreath! If it does not have a twisty tie glue to the top with a hot glue gun. 3. )Glue the letters to the plank. Then when it is dried, glue the plank to the bottom of the wreath. 4.) Lastly after plank is glued, glue the pine cone and flowers! Hint: I like to do them where it matches on each side! The most important thing to remember is to make it the way that will make you happy! Everyone has different tastes, so if you want red flowers instead of white “Do it”! Thank you! Enjoy your up and coming Christmas Season! This wreath is super cute. I need to make a new one for the house this year. I hope you had a great Thanksgiving!